thesis | Roping Towards a Ph.D.
I’m going through a very difficult period at the moment. For personal reasons I have to intermit and return to Taiwan. I will still work through my thesis corrections during intermission, but at the moment I’m juggling about five things at the same time and I haven’t worked on the thesis for about a month now. Dealing with the move, applying for intermission, packing, arranging shipping, worrying about my thesis, feeling anxious about life when I move back… … etc. etc., it’s as if I’ve fallen into the doom of failure and I would live there forever. However, I just received a text message from a friend who’s passed his viva with minor corrections. We’ve been doing aerial together for a couple of months until one day we realized we’re actually doing a PhD in the same department. We meet regularly during training, so much of our conversation was about aerial rather than the usual “how’s writing going” or “have you been to a conference recently.” Of course, we still talked about the struggles of the PhD, but we connected more through our passion for aerial rather than the PhD. Just a moment ago I realized I probably wasn’t going to live in doom forever. I noticed I was smiling as I texted him back. Rather than hoping that someone else would also get major corrections and experience the misery I am in to make myself feel better, I genuinely felt happy for him. If I am still capable of feeling happy for someone, then I haven’t let the PhD beat me completely. Posted in Others and tagged major corrections, PhD, thesis. Bookmark the permalink. In need of boosting my writing productivity, I’ve been trying out the Pomodoro Technique. You can find more information about the technique here, but I’ve been using the technique in the most simple way: you set a count-down timer for 25 mins., work through this time period on the task at hand, then rest for 5 minutes. After resting, start again. Every time you finish a 25 working cycle, draw a tomato. I’ve known about this productivity technique for years, but never tried it properly until recently. What didn’t work for me before was I used a timer on iGoogle, so every time I needed to check for references or journal articles, the timer on the screen distracted me. I gave up very quickly. I remember a friend who completed her PhD saying that the technique really worked for her, so a couple of weeks back I decided to give it another chance. 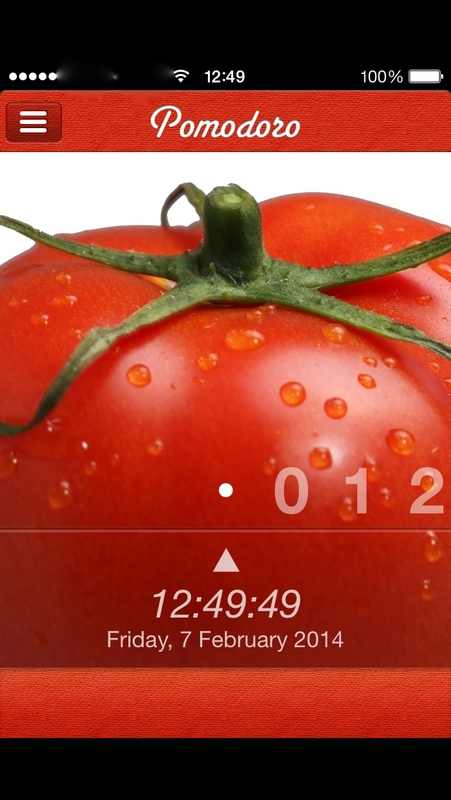 I downloaded a free Pomodoro app for my phone. I also lowered the phone’s volume so that it’s still loud enough for me to hear, but not give me a jolt when the timer goes off. This time I found the technique surprisingly effective. Because I know there’s going to be a break after 25 mins., I’m able to focus on the thesis better by reminding myself that I can surf on the internet or procrastinate later. It also gives me a great sense of satisfaction to see how many tomatoes I’ve drawn each day. Drawing tomatoes helps me monitor my working hours. I’m not an early riser so I always assumed I was more productive in the afternoon. But I realized that my ideas are actually sharper in the morning so it’s easier to write within the first two hours after I wake up. 25 mins. might not seem like much, but as I accumulated 25 mins. throughout the day, I was surprised at the number of hours I could work on the thesis without distraction. These 25 mins. are like sprinting, so they are quality research and writing time. When I count the tomatoes I’ve worked through the day, it helps to get rid of the guilty feeling wondering whether I’ve written enough. This method also counters the need to have substantial writing time blocks. It’s always better to have the afternoon or the morning free for writing, but when little tasks like doing the dishes or running errands pop up in between, it can feel as if your writing time is being broken up. I use the Pomodoro technique every time I work on the thesis, so even if I have to leave my work miday, I still have a grasp of how much time I’ve spent on writing. If I’m finding it really hard to concentrate, I disconnect the internet. I get distracted easier in the afternoons. This is the time when subconsciously I start measuring how much more work I’ve got to do before the end of the day. I lose motivation to do the corrections and have to fight hard to resist procrastination. The gesture of disconnecting the internet itself–unplugging the cable or clicking off the wifi–somehow helps to embed the action into the brain. It’s a bit like quitting a bad habit. So when I want to search for something and find that the internet is off, I remember I’ve turned it off for a reason. Resisting one or two urges to use the internet usually helps me get into full writing mode. What techniques do you use to boost writing productivity? Posted in Thesis and tagged major corrections, PhD, Pomodoro technique, productivity, thesis, writing. Bookmark the permalink. Everybody’s viva experience is different. A friend of mine had a horrible time despite passing with minor corrections. The external examiner was very aggressive, and he kept asking her the same question as if waiting for her to make a mistake. Hats off to her for keeping her cool, and answering the questions with assertiveness and stood by her position. But the aggressiveness she encountered during her viva has put her off completely from going into academia. I also know someone who, despite getting major corrections, enjoyed the experience. She appreciated the opportunity to discuss her work in depth with two experts in her field. So how do you prepare for an unusual situation like the viva? I think there’re still some general “rules” we can follow, as most humanities vivas look for the same thing: can the candidate explain their argument clearly and eloquently? Is the candidate sitting here, in fact the person who wrote the thesis? Does the candidate demonstrate wider knowledge beyond his/her thesis? Can the candidate handle criticism? time you open it. But try to read it again at least once, and make notes on parts that you think can be clarified. I bookmarked these parts with post-its. Most people wait at least two to three months for their viva, so reading the thesis again is a must to remind yourself of what you wrote. 2. Prepare index-cards. Let’s say your thesis is about postmodernism and you use Frederic Jameson and Linda Hutcheon’s theories. In the index card, write a few key-words about Jameson and Hutcheon’s arguments and memorize them. This way, even if you get brain freeze you can still pull out something from the back of your head. 3. Have a mock viva. Even though having a mock viva with your supervisor is never going to be the same as the real viva, it helps to give you a feel of the dynamics in a viva. It’s also very helpful in pre-empting what examiners might ask, especially if you think they’re going to probe on a weakness in your thesis. If your supervisor is not familiar with what a mock viva is, ask him/her to prepare four to five critical questions about your work. This can range from methodology, to thesis structure, to locating your research in the field. The best time to have a mock viva is two weeks before your actual viva. If it’s too soon, you might forget the intensity you feel when answering the questions. If it’s too late, you might rushed into the viva. 4. Don’t be defensive. I’ve heard this again and again, so I call it the golden rule. The wording “oral defense” can be a bit misleading, because the viva actually implies “engagement” with your examiners by defending your critical position. If you become too defensive (i.e. raising your voice towards the examiners), examiners will begin to wonder why you’re not confident towards your own work. If you agree with everything they say, they will also doubt whether you have any critical position at all. It’s a balance of acknowledging the other person’s viewpoint, but also asserting your own. 6. What are you going to do with the thesis? My examiners didn’t ask me this question, but apparently it does come up. Have an answer ready about how you’d like to revise it into a book: Would you adjust the structure slightly to change the scope?Or add another chapter to make the thesis more comprehensible? I hope these suggestions have helped a bit. If you’re having your viva soon, best of luck! Posted in Thesis and tagged academia, Doctor of Philosophy, oral defense, PhD, thesis, viva. Bookmark the permalink. The other day someone came across my blog with the search term “PhD viva questions.” I realized even though I’ve whined and moaned about the viva, I haven’t written about the viva itself. So I thought I’d write a post about what the actual viva was like, and how I prepared for it. Despite getting major corrections, my examiners said I gave an “impressive viva performance,” so I feel confident that at least I prepared for it the “right way.” I hope this helps just in case you’re panicking before your viva. If you’re not panicking, great and keep it up! Believe in your argument and just think about how to explain it effectively. I will write about how I had mock vivas with my supervisors and prepared index cards in Part II. In the UK, a viva (viva voce), or “oral defense,” is typically examined by one internal and one external examiner. Internal means an academic from your department, external means an academic from another university. Sometimes there’s an additional academic acting as chair person, but this person does not participate in the decision making of awarding the student the PhD. Humanities vivas can be as short as one hour, or last as long as two hours. Unlike the US, vivas in the UK are not open to the public, hence leading to speculations about “what goes on inside the room.” Externals are usually the ones who evaluate the student’s work and make the final decision. In my case the internal also acted as chair person. Before the viva started he said it was going to last from forty-five minutes to one hour. First they asked me to explain what the main argument of my thesis was, then they took turns in asking me questions. The internal asked me about my thesis title, and why I used the concept of “trauma” when film studies is trying to move away from it. My external asked me about my methodology, how I selected the films for my case studies, how I surveyed my literature, and finally, why I didn’t I talk about concepts “X” and “Y” since they have become prominent in my area of research. What gave me a bad feeling was a question towards the end of the viva. My internal asked me, “between concept A and B, pick one to explain its relationship to transnationalism.” If the viva is a chance for the student to explain his/her argument, isn’t the examiner supposed to ask the student to elaborate, rather than presenting the question as a multiple choice? I felt a bit insulted when he asked the question this way, but still gave what I thought was a satisfying answer. After they finished their questions, my internal asked me to leave the room so they could discuss the result. When I came out I looked at my watch, and realized that exactly forty-five minutes had passed. My bad inkling deepened because a friend who got major corrections two years ago (but who passed after re-submission a year later) also had a very short viva. When I was asked to go back to the room (I waited five minutes at most) and I sat down, my internal delivered the verdict that even though it was a very impressive viva performance, the thesis was not of a PhD quality yet. Therefore I would need to revise the thesis with major corrections. I was very upset and almost in tears, but I still summoned up the energy to ask whether there was a conceptual problem with my thesis. I wanted to get a clear idea of what was wrong with the thesis when their viva questions were still fresh in my head. My external provided the explanation that there were too many things on the table, so my argument wasn’t explicit enough. Now I know my viva was very short because my examiners had already made up their minds about my thesis before going in to the viva. I’ve learned that the viva is important, but the thesis weights more than anything. It felt like the examiners were using my answers to match with or reassess what they’d read in my thesis. In my case, they felt I gave better answers in person than the thesis itself, hence the need for major corrections to match what I said in the viva. Since examiners are confirming what they think about the thesis through the viva, it seems unlikely that what you say is going to worsen their opinion of your thesis, even if they think it needs more work. I can generalize that if you’ve written a good thesis, getting brain freeze or tongue tied is not going to strip the degree that you deserve away from you. I think I’ve gained a more positive perspective since the viva, and I’m glad I can write about it now without getting angry or depressed. I can even joke about it a little. A viva is really quite an unusual situation: it’s a combination of a job interview and an oral exam. One of my supervisors told me that because of this particular scenario, preparation is key. Good preparation will help maximize the knowledge you already know. I’ll write about this preparation in the next post. 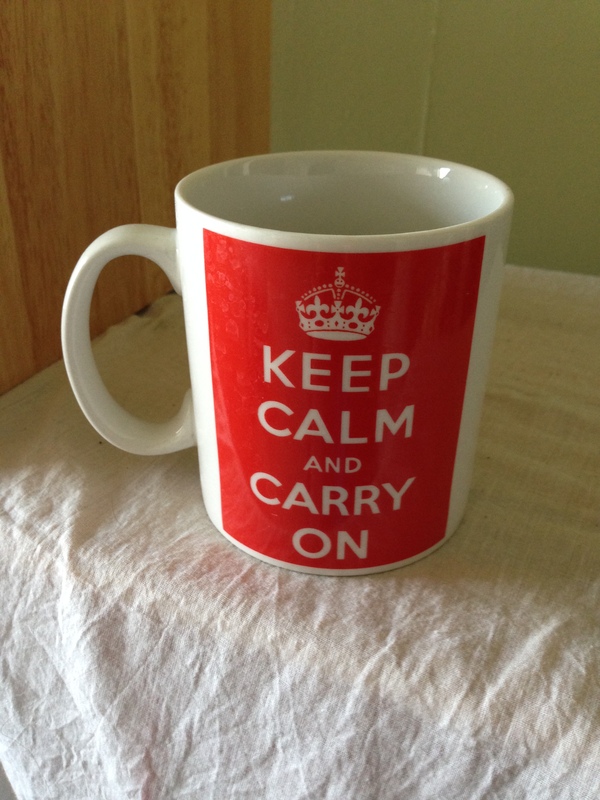 It’s a cliche, I know, but repeating “keep calm and carry on” to yourself does help sometimes. Posted in Thesis and tagged academia, Doctor of Philosophy, major corrections, PhD, thesis, viva. Bookmark the permalink. Things have been a bit hectic lately. I was busy revising my thesis introduction. I had supervision today and it went well. My supervisors are happy with the direction the revision is going. I’m relieved as well because even though I felt I was doing all the right things, I wasn’t confident that they made sense. Even though I’m making the same argument in my thesis, I’ve pretty much had to rewrite the introduction. This involved a painstakingly process of brainstorming, rewriting my abstract, asking myself what are research questions are, what is my methodology, what my critical intervention in the field is, and stripping down concepts that are related to my argument, but not directly relevant to my core project. Through this rewriting process I realized that my argument wasn’t clear enough in my previous thesis version. Not that my examiners are right–they were mean and harsh in the viva report so I retain my right to be childish about this–but I can see that although my argument was clear in my head, it wasn’t articulated as crystal clear as it should be. I think this is why apart from having to overcome the emotional setback of major corrections, I had trouble rewriting the introduction. Students often imagine that readers will closely scrutinize their small critical comments and discussions in early chapters and ascribe them a far more importance than they actually will (p.58). It was a horror to read this because I’d fallen into the trap of thinking that my examiners would notice the conceptual connections I was making… Of course they didn’t. Because examiners are busy people. They probably only have time to read your whole thesis once, and read your introduction and conclusion one to two more times. That’s it. If they can’t grasp the argument in the first few pages, they’ll probably start having doubts about what the thesis is trying to say. I’m learning this the hard way. Throughout the rewriting process I felt like a dog chasing its own tail. Sadly I know there is more of this to come. There was a point where I couldn’t separate my Methodology section from my Thesis Structure, so I began to procrastinate a bit. I told myself that I needed more time to sort out these structural issues. I’d missed my first deadline of sending the revised Introduction to my supervisors. They gave me a push by asking me to send them what I’ve got. I give them credit for being on my case. I’m psychologically preparing myself to do the same for my Chapter 1 as well. I have a deadline by mid-January to revise Chapter 1. 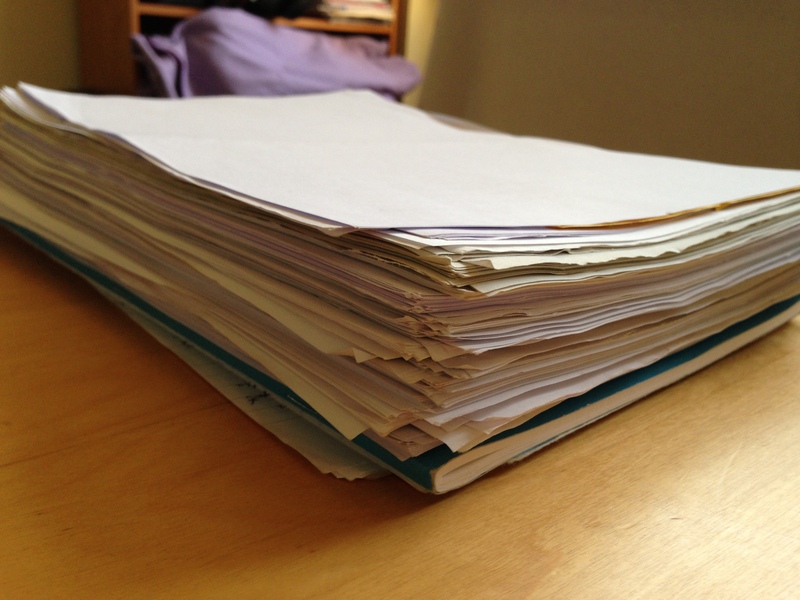 When I submitted my thesis earlier this year, I was tired of my thesis, but didn’t hate it. Now I’m literally sick and tired of it. A friend told me it means I’m on the right path. Posted in Thesis and tagged academia, Doctor of Philosophy, major corrections, Patrick Dunleavy, PhD, thesis. Bookmark the permalink.